I have to admit that I have a type. Don't we all, though? While I 100% recognize that what my makeup collection needs is variety, I can't help but feel compelled to basically pick up every palette that is in that ABH Modern Renaissance type of vibe - especially in the drugstore. It's basically the new Naked palette, with dupes coming out a lot recently. 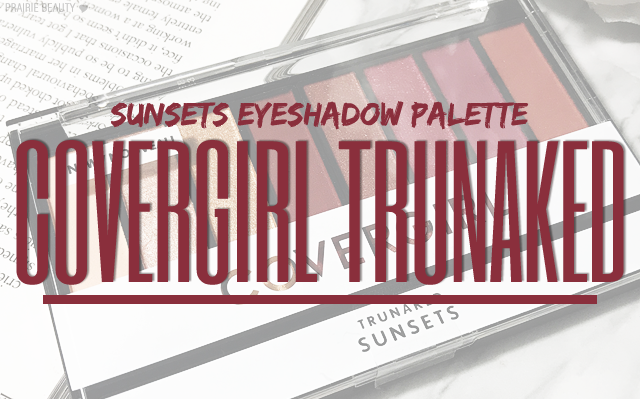 The latest into the fold is the CoverGirl TruNaked Sunsets Palette and I tried to resist it, I really did, but there was just no stopping me once I picked up the Peach Punch Palette and remembered just how much I enjoy the CoverGirl TruNaked eyeshadow formula. Keep reading for my full review with two - count 'em, two - dupe comparisons! It's not really difficult to see the inspiration from the Modern Renaissance palette when you look at this palette, but we'll get into the dupe question a little bit later in the post. 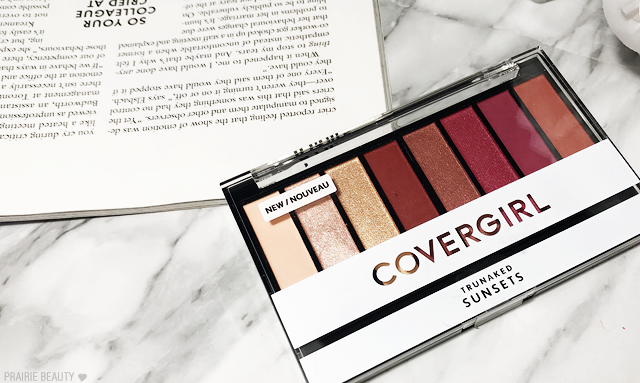 Like the Peach Punch palette, I think that curation is important to talk about here because CoverGirl had to choose how to put this palette together and get all the important things to comprise a complete, stand alone palette with only 8 shades. I think they did a pretty good job, but there's definitely one thing that I would personally change about this curation. This palette has two metallic shades, four mattes, and two sort of satin shades, which I think is a good selection of finishes. However, I would have liked to see them replace the satiny mid-toned rosy brown with more of a midtoned matte transition shade, because I feel like that's what's missing from this palette. It's absolutely usable as it is, but I think I would find it easier to use if it had a transition shade in it. Unlike the Peach Punch palette, which was divided into two quads, I think this is definitely less of that. 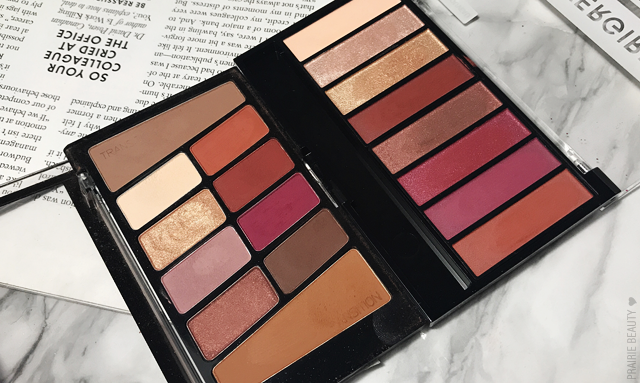 I personally tend to jump around the palette when I'm using this, depending on whether I want a rosier look or a more burnt orange look. And really, that's what you're going to get with this palette. There's no truly neutral or cool toned looks that are going to come from this particular palette. Of course, that's not at all a problem from where I'm standing. When it comes to the formula in this palette, I really, really like it. I actually find that even though it's really soft and there is some fall out, even with the deeper shades I don't have any trouble dusting it away with a powder brush. I find that pigmentation to be really good in every single shade in the palette and the way they build and blend makes them really easy to use. Every time I've used this palette, I've ended up with a look that I really like and I didn't have to work too hard to get there. Though there isn't a deep matte brown shade, which I tend to reach for to anchor most of my looks, I feel like the deeper matte shades - Shade 4 and shade 7 respectively - work really well to add depth where I need it. Shade 1 is a creamy matte vanilla shade that is quite close to my skin tone and works well on the brow bone, though it doesn't add a lot of highlight. It makes a great base over my primer. It can be a little bit bunchy when swatched, but applied with a brush it's quite smooth. Shade 2 is a metallic champagne shade in a neutral enough tone that I find I can use it as a lid shade in both rosy and orange toned looks. I find that it works best applied wet on the eyes, but can also be applied dry for a more subtle sheen. Shade 3 is a more golden metallic shade that is absolutely gorgeous and works best for those more orange toned looks. It's also best when applied wet, but can also be used dry for a more subtle look. Shade 4 is a sort of brick brown matte that's great as a final crease/outer corner shade that is great for anchoring a look. I would personally recommend this to be used with the more orange toned looks, but pairing it with the rosier shades gives nice dimension as well. Shade 5 is a rosy brown satin shade that I personally use as a crease or transition shade. It works both with the rosier looks and with the orange looks, but I think it falls more into the former category. 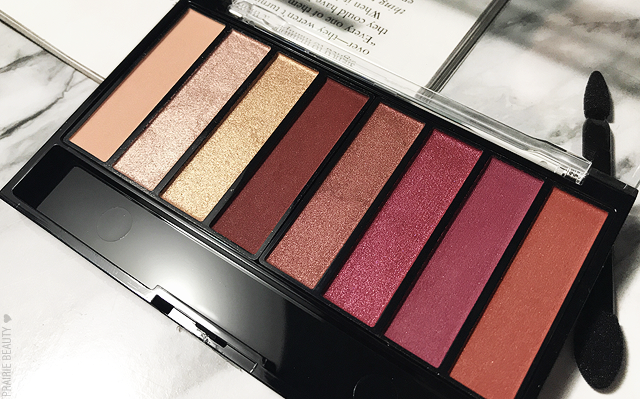 Shade 6 is a slightly satin cranberry shade that again works best when used in the crease for me. It has a nice depth to it and falls really well in line with both rosier and more orange toned looks. Shade 7 is a bold matte berry shade that is probably my favorite in the crease. It blends beautifully and really maintains its color even when blended out. I like to pair it with Shade 2 for one of my favorite bold pink eye looks. Finally, Shade 8 is a medium-deep warm toned brown matte that serves the same purose as Shade 7, but in your more orange toned looks. It also maintains its colour really well and blends beautifully into the crease. When it comes to the shades, I have to say that the majority of them are basically bang on dupes in both shade and finish. There are really only two shades that I can see any discernable difference in and they're the first two in the palette. Shade 1 is closest to Tempera, but they're not the same at all. The CG shade is a buttery coloured matte while Tempera by ABH is distinctly satin, quite a bit lighter, and more neutral toned. Shade 2 is very, very similar to Vermeer by ABH, but has a bit more of a rosy undertone where Vermeer is solidly champagne. Everything else is the palette is pretty much a bang on dupe. Shade 3 is a dupe of Primavera. Shade 4 is a dupe of Red Ocre. Shade 5 is a dupe of Antique Bronze. Shade 6 is a dupe of Venetian Red. Shade 7 is a dupe of Love Letter. And Shade 8 is a dupe of Realgar. Because the ABH Modern Renaissance palette is contains literally my favorite shadow formula ever, I wasn't really expecting the CoverGirl TruNaked Sunset palette to come anywhere near it. I have to say that I was actually really pleasantly surprised when I swatched these next to each other and really felt the similarities in the formulas. Let me be clear, I don't think that the CG palette beats out or even matches the ABH, which as far as I'm concerned is some kind of voodoo magic formula, but it actually does really get close and I'm super impressed upon the comparison. If you're in the market for a drugstore alternative to the Modern Renaissance palette - which, let me be clear again, is probably my all time favorite palette and well worth the spend - this is a seriously solid option at a much lower cost. 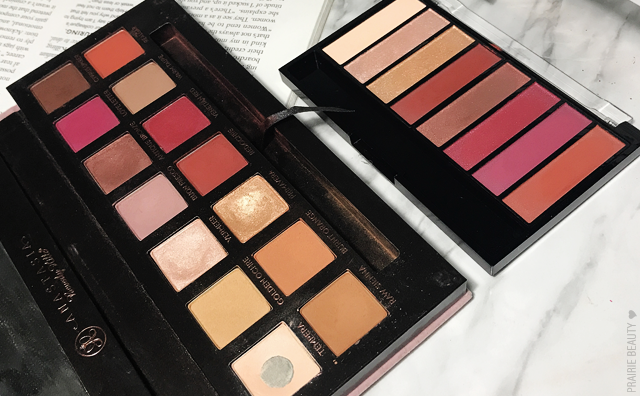 Because these are the two obvious Modern Renaissance dupes in the drugstore, I did definitely want to compare and contrast these two palettes. I was actually surprised to find that the 6 shades that appear in both palettes are actually not bang on dupes. CG Shade 1 is slightly deeper, more peachy shade WnW Shade 2. CG Shade 3 has less coppery tones and seems to catch more light than WnW Shade 3. CG Shade 4 is a touch deeper than WnW Shade 7. CG Shade 5 is pretty much a dupe for WnW Shade 5. CG Shade 7 is a hair lighter than WnW Shade 8, but has a MUCH more pleasant texture where the WnW is dry and a little bit gritty. Finally, CG Shade 8 is a little bit lighter and less red-toned than WnW Shade 7. Honestly, I'm being quite nitpicky here and these shades will probably be indistinguishable on the eyes, but I do like to be precise. Very similar... but not quite on most of the shades. Differences are more obvious IRL. It's actually hard for me to choose between these two palettes. I feel pretty confident that I like the CoverGirl formula better, especially in the deeper, bolder shades that I find a little bit dry in the Wet N Wild palette. But with the Wet N Wild palette you're getting two extra shades, including the very important transition shades that really build out the palette for me. The Wet N Wild is also at a lower price point and you do get more product. For me, there are pros and cons to both palettes and I don't think I could choose a favorite, but I really don't think that you need both in your collection. 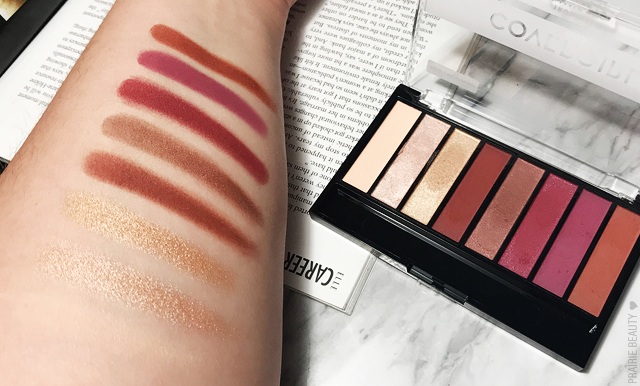 If you like a stiffer shadow with more intense pigmentation, I'd go with the Wet N Wild, but if you like a smoother texture that blends much more similarly to the Modern Renaissance palette, I'd go with the CoverGirl. I know this post has been long AF, but I really wanted to do a comprehensive review and comparison of this palette. Overall, I really do think this is a great drugstore palette and that the CoverGirl TruNaked eyeshadow formula is really underrated. CoverGirl is really, for me, reemerging as a drugstore brand to really pay attention to and I love that they've gone with a new modern look to go along with their new modern formulas. Definitly recommend this, particularly to those who have wanted to try the Modern Renaissance palette but are looking for a lower cost option. 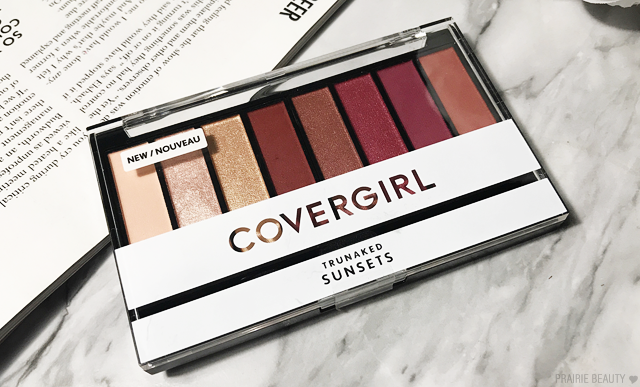 The CoverGirl TruNaked Sunsets Eyeshadow Palette is widely available now, so look for it on local shelves!